When I decided to join Me-Made-May for the first time, I decided I would take the opportunity to evaluate the pieces in my closet. I wanted to think through what I liked and didn’t like as I wore the garments, some of which haven’t been seen the outside of my closet for months, at least. Basically, I am using this to move closer along the spectrum towards I-LOVE-EVERYTHING-IN-HERE utopia, a goal I can’t imagine ever reaching but closer is better. Apparently, I’ve decided by default to break my MMM reports into 3 posts over the month. Feels about right. This was my first make from the Colette Taffy pattern, blogged here. From a fit perspective, it is almost perfect — the shoulders are a little wide, but nothing I can’t live with. When I made this I understood very little about dart manipulation, so I left the darts as they were designed in this pattern written for bias-cut chiffon, even though I was using cotton jersey. That’s not a move I would probably make today, but I didn’t know any better. But the thing is, I think maybe that’s why I like the fit so well. This jersey is very stable, some stretch but it’s reduced by the non-stretchy embroidery. If I were making a Taffy again from a fabric with similar properties (and I should), I might even leave those darts right where they are — is that crazy?? Anyway, I do really like this shirt but the fabric isn’t the best quality — the nylon(?) thread on the back of the embroidery is sometimes scratchy, and there are tiny holes left by the embroidery needles, some of which are growing and I’ve already patched. So I’m sure its days are numbered. 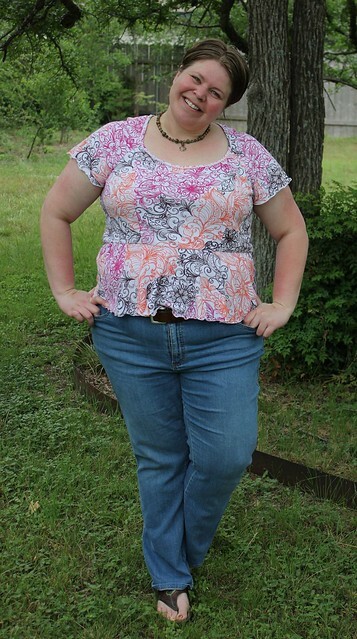 I blogged this top at the beginning of this year. I’ve worn it a handful of times, but I don’t love it as much as I did initially. To begin with, the placket on the front just doesn’t lay quite right, even with well-placed snaps. Also, I just don’t love the mega collar. It’s not my favorite look for me; in fact, this pattern has already gone into the donate bin. I like the shirt enough to keep it at this stage, but it’s on the cusp. Side note, this was my first phone timer shoot ever — my husband was out of town on a business trip, so I had to find an app to take selfies. Took more time by far to take one decent, focused picture than when he snaps enough for a whole post. I’m sure I’ll get the hang of it! 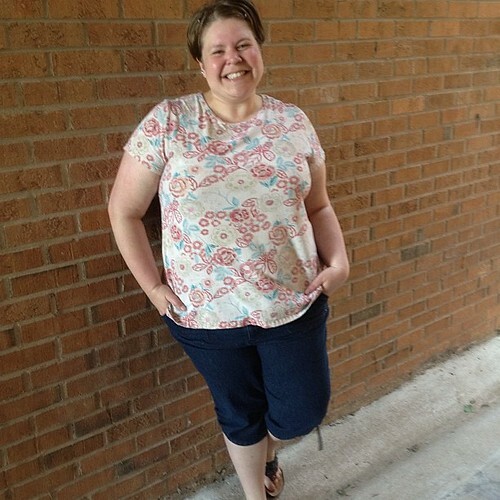 I never blogged this t-shirt but it was my second make from Vogue 8536. (My first was blogged here, and rest assured it will make a very faded appearance this month.) The fabric was from Denver Fabrics from forever ago, and it is a medium weight cotton-lycra blend. I wear it lots and lots and it’s pilling and I need to make more. May 05 — nada. Well, not nada, I’m sure I wore something?? 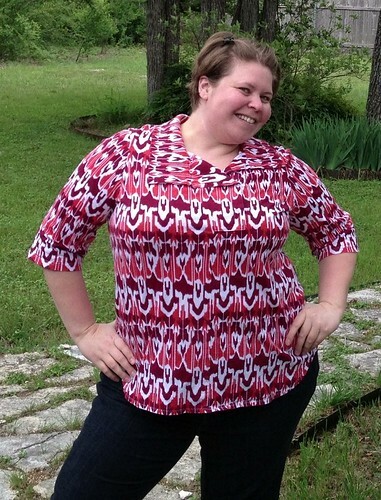 This was my second make from the Sewaholic Renfrew pattern (blogged), and it’s still my favorite. Here’s a funny little story about this top… After I made it, I gave my leftover fabric to Dixie, who decided it really needed to be the exact same thing. Dixie is a close friend of mine IRL* so we’ve accidentally been t-shirt twinsies a couple of times. THEN, earlier this year, I saw a picture linking to a post from Roobeedoo, who had bought the exact same fabric and made herself a Renfrew from it too, at almost the exact same time. 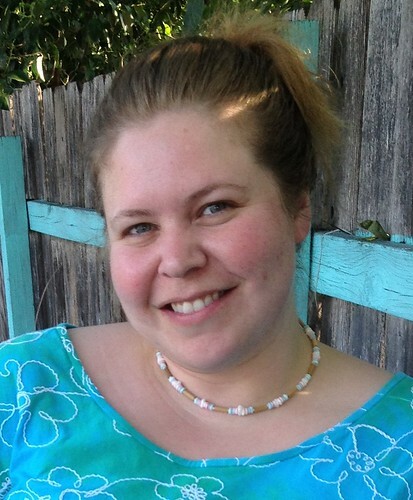 (Hers is long-sleeved with a cute lace collar.) So if you ever come across any of this fabric, just know that IT WANTS TO BE RENFREWS ONLY RENFREWS. Hey it’s a whole TWO me-made pieces! The top is my first Renfrew, which still gets wear despite being a teensy bit too short. 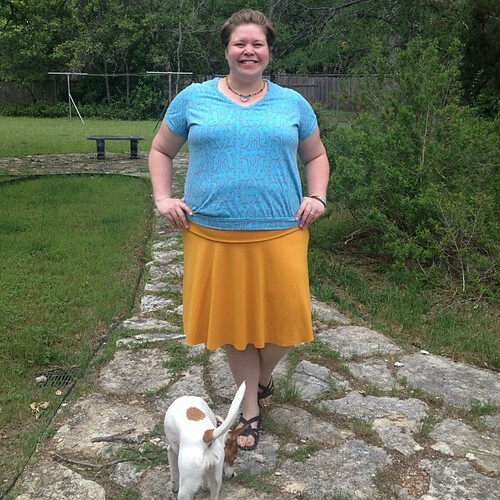 That makes it work kinda great with this skirt though, which I’m still loving! 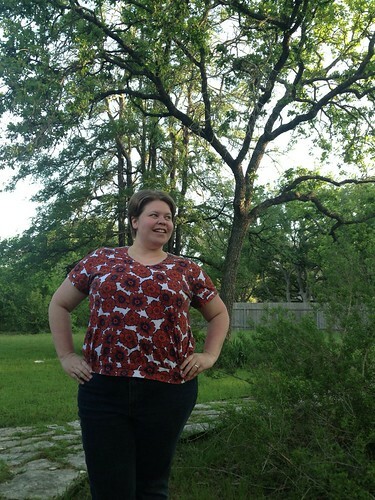 Yesterday, I took pics of this top, blogged it, and then just to give it a really fair try, wore it until bedtime. Opinion firmly cemented. Still a no. I am going to keep it until I get ready to re-make it, so I can be sure of the changes I want at that time, and then it’s getting donated. I didn’t realize the Friday theme element of MMM until last week, so this is my first attempt to participate in that part of the process. (I really want to get my studio shined up and blogged about in detail one day… I lurve it and I totally dig other peoples’ studio posts.) 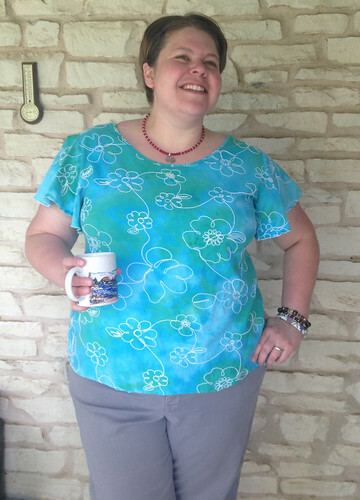 My top is Simplicity 1805 from my “accidental pajamas” post and it is another one that gets worn to death. 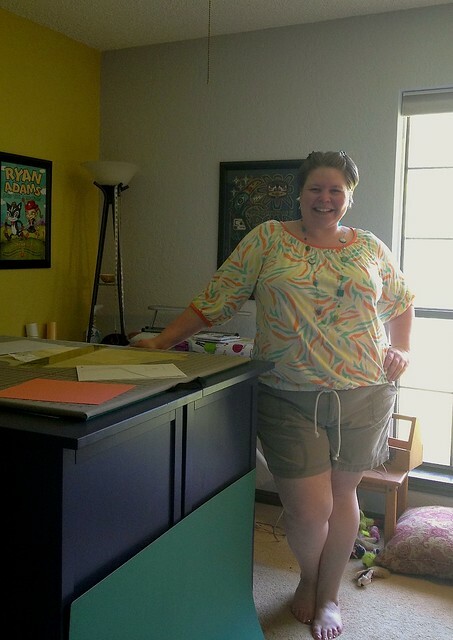 The shorts are RTW — I think from JCPenney! — and they will probably be my first rubbing-off attempt from this masking tape technique. Most of the fit is really good; it would be leagues ahead of where I’d start with a pattern. According to my highly questionable calculations, if I vowed 5 items per week, that equates to 22.14 items for the month, or 7.38 items per volume in the trilogy. So I’m ahead of the game, woot woot! But I am unofficially stepping up my vow to repeats-don’t-count, in the spirit of the retrospective I’m trying to accomplish. I’ve been pretty brutal about getting rid of undesirables, so I don’t have as many me-mades as you might think — even a few things that I’ve blogged within the last year, I no longer have. It’ll be tight! For having such similar patterns in our stashes, its funny how different our first weeks of MMM look! I really need to get on the casual shirt making bandwagon so that I can do the jeans thing sometimes too. I absolutely love your shirt on May 2!! I know if you don’t feel the love, then you probably won’t want to keep it…but I think it is totally cute on you and you did a great job on it. You have some great clothes there Susan. Shame you are not in love with may 02 – That is my absolute favourite on you. 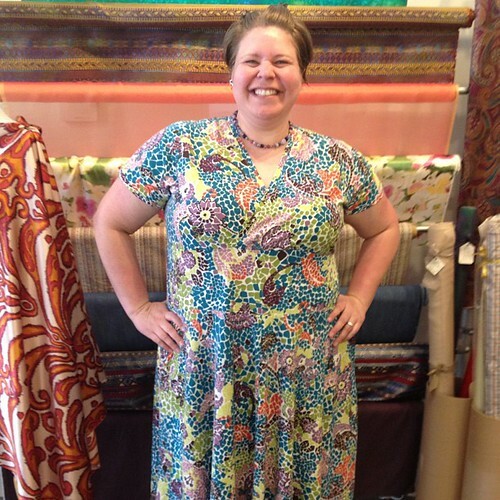 Love the look of it and the vibrancy of the fabric looks great on you. I couldn’t do MMM so I’m hugely impressed with anyone who manages it. Looking good! Great looks-I always smile at your photos because your clothing is colorful and youthful. I love you in 3/4 sleeves!! And the collar on May2 is cute on you. Finally, do I see a jack russell tail? A relative of my little Nick? that tira is so cute on you!